HAMILTON, N.J. — THE sculptor Ming Fay was directing two assistants atop a hydraulic lift as they positioned his three-foot-tall pine cone on a ledge far above his head. The fruits, seeds, seed pods, leaves and vines, along with human and animal figures, are inspired by nature but as fanciful as science fiction. “Sideways,” he requested. Then, “Vertical.” Satisfied, Mr. Fay turned his attention to other pieces awaiting his attention: a giant leaf, a huge shark’s tooth, an enormous littleneck clam shell. As he found a place for each in the new East Gallery at the Grounds for Sculpture, he moved around silently, examining the collective effect from every angle. It was the last day setting up an installation, on view in the gallery through February 2013, that took six weeks, with Mr. Fay, 69, spending two days a week on the project. Curators from the sculpture park first approached the artist last fall, when builders were framing out the 25-foot-tall gallery space, originally a warehouse. Over the winter, hundreds of pieces from the sculptor’s studios in New York and New Jersey were disassembled, packed into four trucks and shipped south. As Mr. Fay put on the final touches late last month in preparation for the exhibition’s opening to the public on May 12, the main components of the installation were already in place, dangling overhead from naturalistic branches attached to girders that support the roof of the space. These hanging pieces, also inspired by nature but as fanciful as science fiction, gave the exhibition its name, “Canutopia,” a combination of the words canopy and utopia. Mr. Fay, whose artwork has been exhibited in the United States and abroad, has been interpreting nature ever since he arrived in New York in the 1970s. Born in Shanghai in 1943, he moved to Hong Kong in 1952, after the Communists came to power in mainland China. Both his parents were artists, and his mother showed him how to make paper lanterns and kites. At 18 he received a scholarship to study art in the Midwest, after which he received a bachelor’s degree from the Kansas City Art Institute and a Master of Fine Arts from the University of California at Santa Barbara. He lives near Union Square in Manhattan and has been a professor of sculpture at William Paterson University in Wayne since 1985. 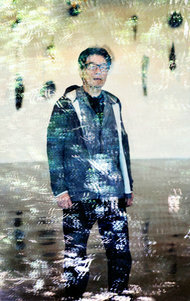 His artwork has been exhibited in numerous group and solo exhibitions in the United States and abroad, and his commissions for public art include a glass mosaic project for the Delancey Street-Essex Street subway station in New York that features murals of an orchard and shad fish. Despite his focus on nature, he has never grown anything or gardened, except in his mind. At first, Mr. Fay recalled, he drew his inspiration from the produce markets of Chinatown. 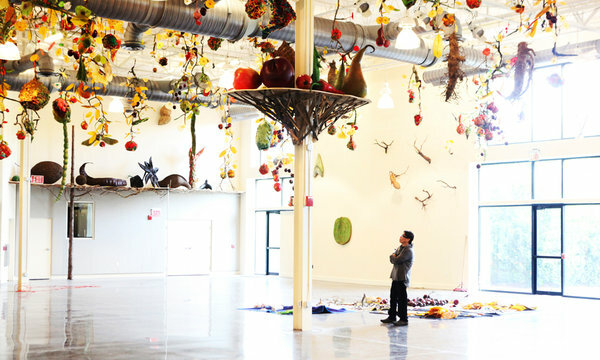 Working with paper pulp, pigments and paints, he molded huge fruits and vegetables over wire. Later he added urethane foam to the mix of materials. At the same time, he became a researcher, digging into his native culture to learn the symbolism of fruits. Peaches, he learned, were symbols of prosperity; oranges, good luck; cherries, love. Mr. Fay visited the Chinese herbal shops of New York to study herbs and medicinal plants like ginkgo and ginseng. He became especially interested in seeds, seed pods and nuts, attracted not only by their shapes but also by their role in plant reproduction. Then he focused on seashells and sea creatures, animal skins and bones. Wishbones became a favorite subject and, as always, an object of study. He learned that the forked bone, located between a bird’s neck and breast, was part of a system for lifting the wings during flight. Mr. Fay traveled all over the world in search of forms that exerted a pull on him. He first saw a monkey pot, the fruit of a tree native to the Amazon region and one of his favorite subjects, at a botanical garden in Singapore. Yet most of his raw material turned up much closer to home. Friends were constantly bringing him botanical specimens, some quite mysterious-looking, which he collected in jars. Over time, Mr. Fay’s sculptures became less representational. He calls them “hybrids,” inspired by the real world but reworked by his imagination. “There’s some reference to reality, but it is twisted, reinterpreted,” he said. Visitors to his current exhibition at the Grounds for Sculpture might not know, at any given moment, if they are looking at a real-life form or a product of the artist’s imagination. Only Mr. Fay knows for sure. That leaf up there, the one he calls a “breadcake” leaf? Not real, though it was inspired by the breadfruit tree. That big spiky ball that looks like an instrument of torture? It’s real — a sweet gum tree pod — just much, much bigger than normal. That sense of mystery drives the exhibition, according to Virginia Oberlin Steel, curator of museum exhibitions at the Grounds for Sculpture. “Canutopia” runs through February 2013 at the East Gallery of the Seward Johnson Center for the Arts, the Grounds for Sculpture, 126 Sculptors Way, Hamilton Township. Information: (609) 586-0616 or groundsforsculpture.org. A version of this article appeared in print on May 20, 2012, on page NJ12 of the New York edition with the headline: Nature in All Its Lushness, From an Urbanite’s Mind.